I turned up to Cult last week to be greeted by a lonely Craig. Usually there are a couple of people that arrive before me. As time passed we became increasingly worried that no one else would make it so close to Christmas and it would turn into some sort of awkward, online dating gone wrong scenario. Luckily a bunch of people turned up. Two of them berating me for not writing the blog for last week, so this will be some sort of combined entry for the both. In the last post I said something about if the cards against humanity players turned up next week I'd count them in the numbers. Well, as it happens they did turn up so true to my word I'll include them. That meant about 19 people two weeks ago and about 13 last week. In all honesty I can barely remember what happened a week ago let alone what happened two weeks ago. I do have a small amount of photographic evidence to jog my memory though. It kind of goes a bit like this; Cards Against Humanity, Dominion, Betrayal at House on the Hill, The Resistance, Lords of Waterdeep and Settlers of Catan. I won Dominion, which I was pretty pleased about. I'm always pleased when I win Dominion. I started off strong in Waterdeep but ended up coming last, if memory served. I think Dan came first. 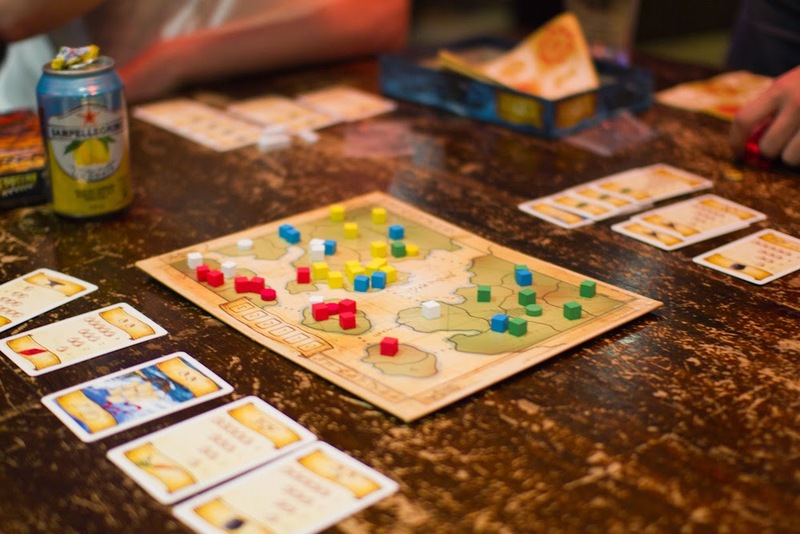 Mike declared it one of the few worker placement games he didn't hate so if anything it's a win for the game itself. 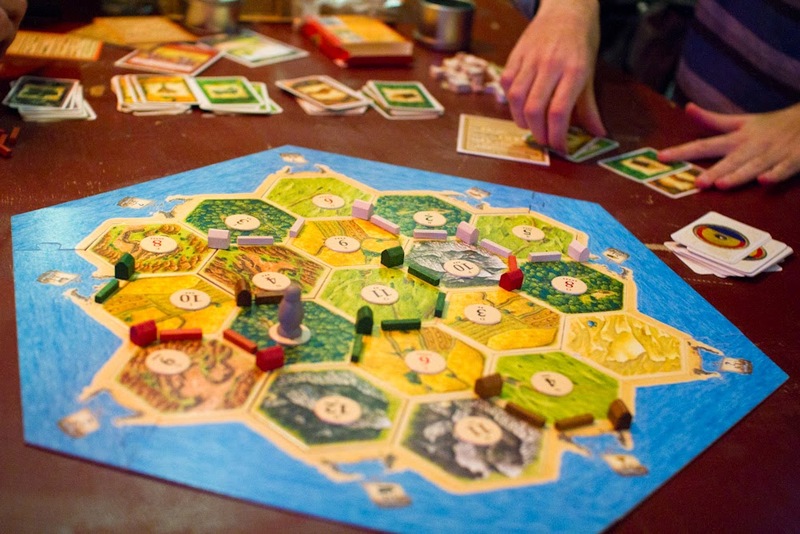 Surprisingly it was the first showing for Settlers of Catan at IpBoG, the game which inspired its logo. I'm sure other games were played but I don't remember what. However I do know a drink was spilt, but this time not over a game, just a bag. We have to start paying attention to the drinks on the table rule. 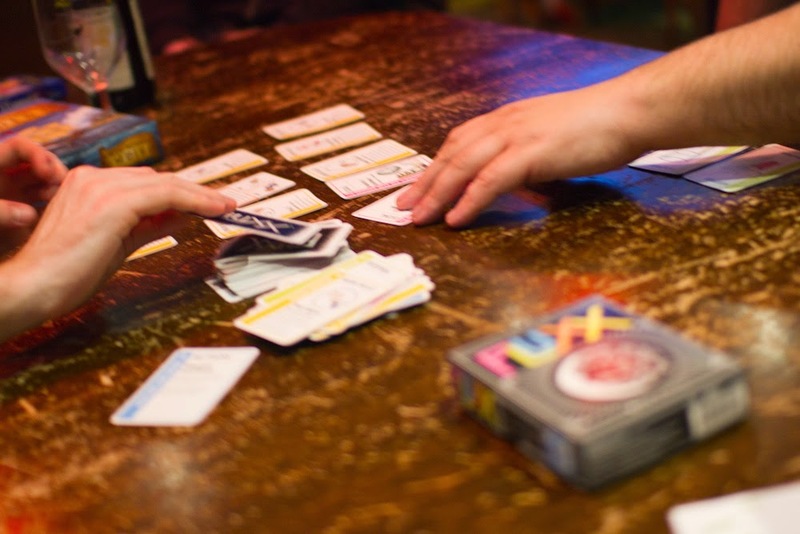 So last week we started off with Fluxx while we waited for people to arrive. The rules explicitly allow people to join part way through so it seemed like a good choice. After a while we had a terrible rule set where we could play only a single card but that card had to be chosen at random by another player. This started to drag so when Dan got a chance he dealt one of his keepers to me, winning me the game. Sometimes Fluxx outstays its welcome and just has to be ended. Other Dan had brought Eight Minute Empire. I jumped at the chance of a go at this. It was a pretty fun little area control/set collection game. I've heard people call it a 4X game but it really isn't. It also isn't 8 minutes, at least with the full compliment of players. It's still pretty quick at around half an hour. We played another 5 player game of Hanabi and did very well again (23 points, I think). Dan wasn't sure if there was a rule change for more players but we didn't think so because we hadn't played it differently last time with 5 players. I've more recently been told that we have less cards in our hands with more players. I've not verified this but it sounds likely. We probably accidentally cheated both times, it was kind of easy. 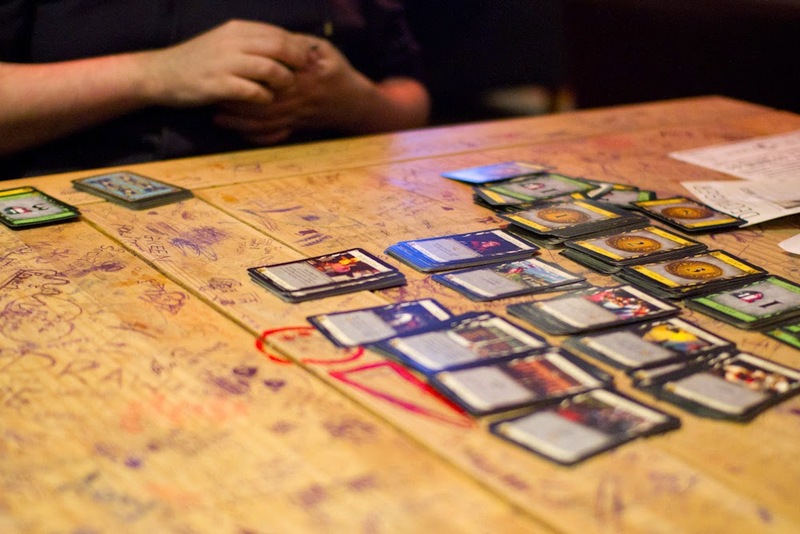 Quarriors made its first appearance. We only made it about half way through the game before closing time. Again so many more games were played but I don't have photos of them so I forget what they were. I'm pretty sure Johnny played Bang! However I do know a drink was spilt again, but this time not over a game, just a crotch. We really have to start paying attention to the no drinks on the table rule. We'll be taking a festive break from IpBoG next week (the 29th) as Cult is closed. We'll be back with a vengeance in the new year, no doubt with a whole host of new board games we received for Christmas. See you there!